Two Reflective Teachers: Slice 13 of 31-#sol17: Tomorrow it's supposed to snow. Slice 13 of 31-#sol17: Tomorrow it's supposed to snow. Tomorrow it's supposed to snow. Sigh. Really? Maybe they are wrong??? I have to say that I'm done with snow days. Here's the positive self-talk: at least we have special formula for the roads, an impressive fleet of snowplows, and plenty of sleds. I could live in Virginia where one of my daughters is going to school. In that case, I could be preparing for the foot of expected snow and total state shutdown. It's hard to maintain the positive self-talk, though, even when my OLW for 2017 is brave. And we're already going to school into the twenties of June. I'm really done with snow days. Tomorrow it's supposed to snow. I'll make soup. I'll write. Maybe I'll watch a movie with my girls. I'm done with snow days, though. I also am finished with snow days. I have a fourth grade lesson tomorrow and a meeting with parents. Wednesday is a big PD day that I want to prepare for. But, I'm sure we'll be at home, so I'll pack my bag for a day of reading tomorrow. I think I have the ingredients for chili. Good luck out there. 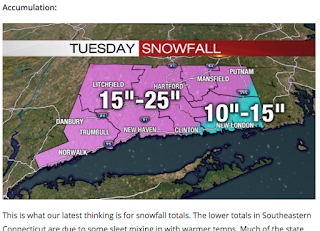 I am gearing up for a projected 18-24" in Massachusetts! Yikes. On the brighter side (maybe) I am certain this storm will provide many new slices / small moment stories - if we have power that is. So glad this storm did not pass through my state first! I understand the deep sigh. What a pain to reschedule conferences and extend the school year. Hope you keep power throughout this storm. Each of us is experiencing such different weather. We've beat records this winter for warmth, and the next two weeks already are predicted in the seventies. We need moisture badly, and I'm fearful that our "snow" may come in an April storm that breaks limbs, etc. I hear you about the conferences. No one wants to have to re-schedule! But, enjoy the soup! I like your action plan Melanie. There's 'snow' stopping you despite the frustration these days may send your way. May you find joy in your planned activities. You can send that snow my way! I'm crossing my fingers and my toes for a snow day tomorrow! Our conferences were already rescheduled for next week. I brought extra work home, but I'm also going to bake some brownies. I haven't been able to stop thinking about them. ;-) Enjoy your day! So funny that we wrote posts that mirror one another as exact opposites. You didn't want one, but got it. I was hoping for that last snow day, but no dice. I am sorry that you will be in school until the mid-20s of June.